The St Ives built schooner Eldred left for Swansea with her first cargo on 26 March 1829. Eldred had been launched on 20 January and Lloyd's Register for 1830 shows her to have been a single deck schooner of 93 tons skippered and owned by J. Matthews. Her crew on that first trip was probably something in order of five men and a ship's boy. 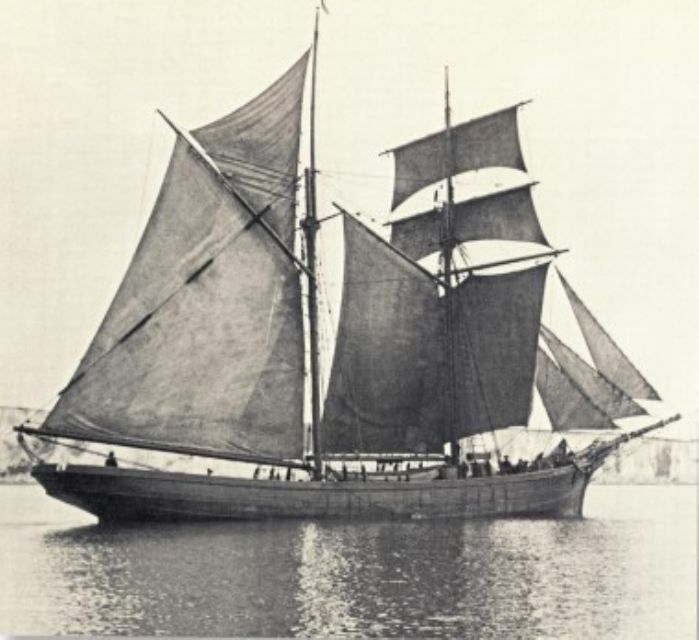 John Tregerthen Short records Eldred as a schooner brig so she would have had a sail plan of two fore and aft gaff rigged sails on her main mast with a combination of square rigged and gaff rigged sails on her fore mast. The advantage of the schooner rig was that it could be operated by a small crew but it did not perform well when sailing to windward. The addition of square rigged sails addressed this but could increase the crew size. Eldred would have looked something like this picture. Copper ore was a backfreight for vessels whose main business was carrying coals from Wales to Cornwall. In 1829 some 162,000 tons of coal was being brought into Cornwall every year, an increase of about 100,000 tons since 1799 while the copper backfreight stood at about 124,500 tons. While the Welsh trade was clearly booming it was, in effect, controlled by by the copper smelters who operated together to keep shipping prices down in the same way that they colluded to depress the price of copper from the Cornish mines. So, when 29 year old John Matthews skippered Eldred on her first voyage he was setting out into business where cargoes were plentiful but margins were very tight so costs needed to be tightly controlled and the ship needed to be be worked efficiently to pay her way. John wasn't going to be seeing an awful lot of his wife and baby daughter Honor who, like Eldred, had been launched upon the world early in 1829. The copper shipping season was at its height between April and October though weather conditions may make it shorter or longer. A fair number of the vessels engaged in this trade were laid up in the winter months but for St Ives boats there was the option of going into the pilchard shipping business. The records for Eldred don't contain a lot of cargo information but occasionally we learn from the diary of John Tregerthen Short what she was carrying. In December 1830 Eldred made a trip to the Mediterranean, she arrived in St Ives from Falmouth in the first week of December, loaded up with 510 hogsheads of pilchards and sailed for Genoa on 11 December arriving on 7 January, a voyage of 27 days. In November 1831 she again left St Ives with 510 hogsheads of pilchard but then she disappears until September 1832. In August and September 1829 Eldred made a trip to Madeira. She arrived in St Ives from Llanelly on 1 August, left on 5 August and arrived in Madeira on 22 August. By 12 October she is reported off Dover and the next day she arrived at Gravesend. A month later on 12 November she arrived at Le Havre from London, at which point we lose sight of her again until she turns up at Belfast in early March 1830 on her way to Londonderry where she arrived on 9 March, reportedly from Alicante. Did she return to St Ives after leaving Le Havre, pick up another load of pilchards and go the Mediterranean, as she did in 1830 and 1831? On 19 May 1830 Eldred arrived back in Gravesend from Londonderry and she does not appear in the lists again until she left Gravesend on 7 July bound for Tenerife. She called at Falmouth on 17 July but there is no record for her arrival or departure from Tenerife and we don't see her again until she arrived back in the Thames on 26 October. Her port of departure is listed as Mogadore (on the Atlantic coast of Morocco) so she has presumably been on a round trip from Gravesend to Tenerife, Mogadore and back to Gravesend, a voyage of about 15 weeks. In December 1830 she makes her round trip to Genoa. So, early in her career Eldred and John Matthews are not concentrating on the Welsh trade despite the early trips to Swansea and Llanelly. In February, March and April 1833 there is another round trip to Mogadore but thereafter her movements seem to be exclusively bound up with the Welsh trade and from late 1833 her home port appears to be Truro. John Matthews and his family evidently moved from St Ives to Truro at about this time and on 23 July 1834 John and Honor's son Daniel was baptised in St Mary's church. Daniel died aged two years in 1835 and in 1837 John and Honor baptised another son Daniel. The baptismal records of his children in 1829, 1834, 1837 say that John Matthews is a seaman or mariner but by 1841, when the family are living in Truro Vean Terrace, John has changed profession and now describes himself as a coal merchant. The family living in Truro Vean Terrace is John Matthews, 40; Honor Matthews his wife also 40; Honor Matthews their daughter aged 12; Daniel Matthews aged four; and Mary Matthews aged four months. Four children (including Daniel who died in 1835) in 14 years of marriage might described as few, for the period. Perhaps testament to the amount of time John Matthews was away from home in those years. The story of John Matthews and the Eldred will be continued in another instalment later in the year. Penny Watts-Russell, The Copper Agent's Story, Continued: The Colliers and Carriers, in The Journal of the Trevithick Society, no.39 2012. provides a background on the vessels and skippers of the Welsh Fleet derived largely from the letter books and other documents held in the Jenkin collection in the Courtney Library at the Royal Cornwall Museum in Truro. The author is grateful to Janet Axten and John McWilliam of the St Ives Archive for their help with this article.